Private Hunter Valley Station hut in the upper High Burn. Hunter Valley own or lease two flats up this valley which they use fro grazing cattle. The bush below and between is crown (DOC) land. Both flats have huts on them. 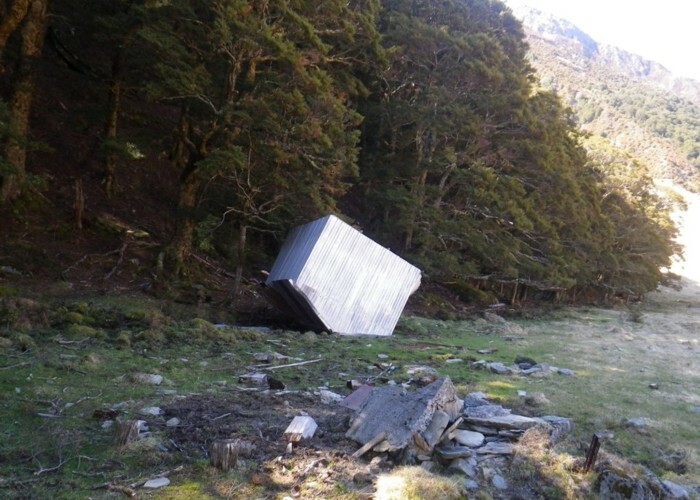 The Upper Burn Hut is, whilst still intact, no longer servicable as shown by the accompanying photo. Upper Burn Hut(High Burn) • By madpom. Licence: cc by.  This hut has been removed or destroyed. Information here is for historical reference only. Added 12 October 2015 by madpommadpom. No revisions.